Any good video with map way to reach this PoI? 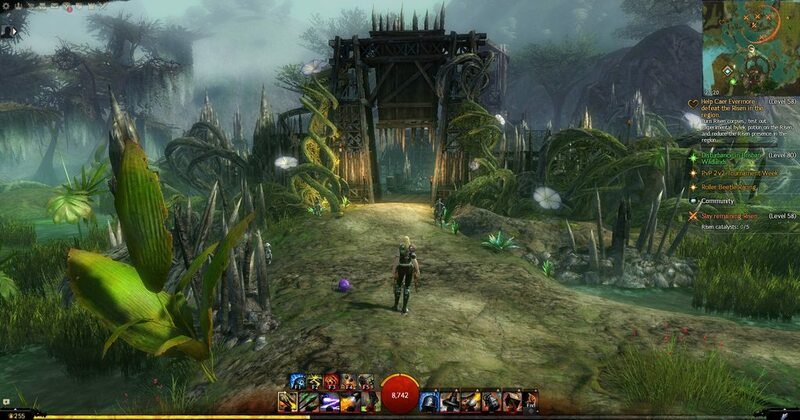 This are changed by ArenaNet before in others chars never see this here. What is name of this PoI? i searching in google for a video and not found any one for this. Inside in cavern is stupid. not see any way for reach this PoI. I'm confused. The POI shown is in the middle of a village. You walk in the village and 'discover' it. If I remember correctly there is a gate at the north edge - where the path meets the wall which should be open. As far as I remember the fort/village is almost entirely surrounded by a wall of thorns and wooden barricades. So you basically have to use the front door, to get inside. Mounts are disabled in the area, so jumping over the fence is no option. And there is an event where the front door is actually locked. Most of us have done this POI already way too many times, but keep in mind what time we have right now. The current generation of newbies has access to mounts, long before many of them decide to explore core Tyria or bother with the Personal Story. For Path of Fire, mapping with mounts is challenging. In core tyria, you can just jump on your Springer and ignore every obstacle straight away. I mean, even the pact-portal in the Durmand Priory can be accessed that way. In Path of Fire there are almost no anti-mount zones. So if you have only solved mapping the Path of Fire way, you quickly run out of ideas when you are confronted with the debuff. We probably get a similar thread soon, when someone is about to enter the Infinite Coil Reactor, while the event is active. Or Jinx Isle. People had been asking about Jinx Isle even before HoT came out but it also doesn't matter since the WP and the PoI inside can be gotten by swimming near it from the outside.